Separate the cards into path, action, nugget, and dwarf cards. Shuffle the required numbers of gold miners and saboteurs together. Deal one card to each player, who looks at it and puts it face down in front of him without revealing his role to the other players. The last card is set aside (also face down) until the end of the round. Find the one start card (showing a ladder) and three goal cards (one with the gold treasure and two with mere stones) from among the 44 path cards. Shuffle the goal cards and place them face down on the table, together with the start card (face up), as shown in the illustration below. Over the course of the game, a maze of pathways will be created between the start card and the finish cards. 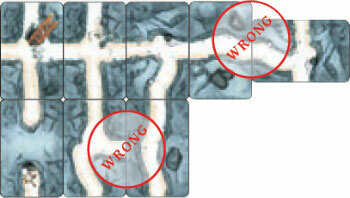 Note that these pathways may extend beyond the borders of the 5 by 9 card pattern indicated in the illustration. 3 to 5 players: Each player is dealt 6 cards. 6 to 7 players: Each player is dealt 5 cards. 8 to 10 players: Each player is dealt 4 cards. Put the rest of the deck next to the goal cards. Shuffle the gold nugget cards and place them face down next to the leftover dwarf card. The youngest player takes the first turn, with play passing to the left. Nothing makes the heart of a dwarf race quite like a nice shiny gold nugget. As one of these intrepid folk, you naturally want to collect as much of the yellow stuff as you can. But are you a gold digger… or a saboteur? The players are dwarves-either gold miners working their tunnels ever-deeper into the mountains in search of treasure, or saboteurs trying to put obstacles in the miners' path. The members of each group should work together, but often they can only guess who their allies are! If the gold miners can make a path to the treasure, they are rewarded with nuggets of gold while the saboteurs leave empty-handed. If the gold miners fail, it is the saboteurs who reap the reward! But, the identity of each dwarf is not revealed until the gold is split up. After three rounds, the dwarf with the most nuggets wins! Pass, by putting 1 card face down on the discard pile. Then, the player must draw the top card off the path deck and add it to his hand. This ends his turn, and play passes to the next player. Note: When the draw deck is used up, the players do not draw cards anymore-a turn then consists only of playing a card. The path cards are used to build a path from the start card to the goal cards. They can only ever be played by connecting to a path card that's already on the table (including the start card). All paths on the sides of the new card must fit with the other cards already in play, and they can never be played crosswise. Important: Newly placed path cards must always have an uninterrupted connection to the start card! Playing Hint: The gold miners will try to build an uninterrupted path from the start card to one of the goal cards while the saboteurs will try to prevent just that. However, you should not be too obvious, or your identity will be guessed very easily! Action cards are always played face up in front of a player (yourself or another player). Action cards can be used to hinder or help the players, remove a card from the pathway maze, or gain information about the goal cards. If one of these cards is in front of a player, he may not play any path cards-of course he may still play other cards! At any time, only one card of each type can be in front of a given player. A player can only add a path card to the maze if there is no such card in front of him at the beginning of his turn. These cards are used to repair broken tools-in other words to remove one of the broken tool cards from in front of a player. They can be played on oneself or on another player. Either way, both the repair card and the broken tool card are placed in the discard pile. Of course, the repair card must match the type of broken tool. For example, if there is a broken mine cart in front of a player, it can only be repaired by an unbroken cart, not by a lantern or pick card. Some repair cards show 2 tools. If one of these cards is played, it can be used to repair either one of the tools shown, not both. Important: All repair cards can only be played if the matching broken tool card already lies in front of the player. This card is always played in front of the player, who may then take 1 path card of his choice (except the start and goal cards) out of the maze of pathways and put it in the discard pile (together with the rockfall card). Gaps created in this way can be filled with an appropriate path card during a later turn. Playing Hint: A saboteur can use this card to interrupt a path from the start card or a gold miner can remove a dead end, providing a new route for the path. When a player plays this card, he carefully picks up one of the three goal cards, looks at it, then puts it back in its place and places the map on the discard pile. He now knows whether or not it is worth digging a path to that goal card (since only one of the three shows the treasure)! If a player cannot or does not want to play a card, he must pass by putting 1 card from his hand facedown on the discard pile without showing it to the other players. If players pass, there will be face up and face down cards in the discard pile-that's okay! Note: Towards the end of a round, there is a chance that some players will have no cards left in hand-in which case they must pass (without discarding, of course). If it is the treasure card, the round is over! If it is a stone, the round continues. The face up goal card is placed next to the last path card played so that the paths fit. Note: In rare cases, it is possible that the goal card cannot be played in such a way that all the paths fit the adjacent path cards. As an exception to the general rule, this is legal-but only for the goal card. The round also ends if the draw deck runs out of cards and no player has any playable cards left in hand. 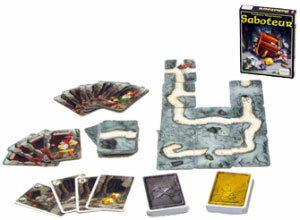 When the round ends, all dwarf cards are turned over: Who was a gold miner, and who's a saboteur? The gold miners win the round if there is an uninterrupted path from the start card to the goal card that shows the treasure. If they do, the player who played the last path card (that connected to the treasure) draws a number of gold nugget cards (face down) equal to the number of gold miners (e.g., 5 cards if there were 5 gold-diggers), looks at them in secret, and chooses 1 card to keep. Then, he passes the rest of gold nugget cards counter-clockwise to the next gold miner (not saboteur! ), who also chooses 1 card and passes the rest-and so on until each gold miner gets 1 card. The saboteurs have won the round if the goal card with the treasure wasn't reached. 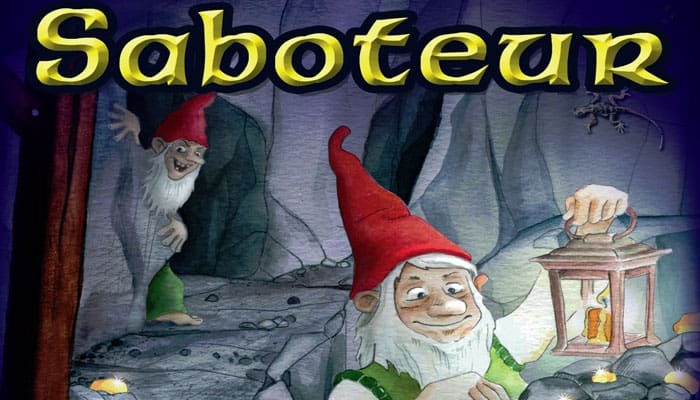 If there was only 1 saboteur, he gets gold nugget cards from the deck worth a total of four nuggets. If there were 2 or 3 saboteurs, they each get 3 nuggets worth of gold. If there were 4 saboteurs, each gets 2 nuggets. All players keep their gold nugget cards secret until the end of the game! 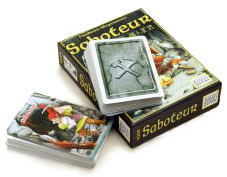 Note: In a game with 3 or 4 players, it is possible that there will be no saboteur during a round. In this case, if the treasure is not reached, none of the dwarves get any gold nuggets! After the gold nuggets are handed out, it's time for the next round. Place the start card and goal cards on the table, just like at the beginning of the game. Shuffle the same dwarf cards as before (including the one that was set aside) and deal them out again. Shuffle the path and action cards, creating a new draw deck, and deal the starting hands. Of course, the players keep their gold nuggets from the earlier rounds. The rest of the gold nugget cards are shuffled again and place next to the extra dwarf card. The player to the left of the one who played the last path card in the previous round starts the next round. The game ends after 3 rounds. Each player counts the gold nuggets on all of his gold nugget cards. The player with the most nuggets wins the game! If there is a tie, they share the win.